20 Healthy, Easy Toddler & Adult Breakfasts (That Are Not Cheerios) | Laura's "Rules"
Unlike most of America (if we are to believe the staggering number of options in the grocery store), I’m not a big cereal person. It never has the get-up-and-go I actually need in the morning to jump-start my confrontation with living. I’ll do a post later on my views on toddler nutrition, but in the meantime, suffice it to say, I’m somewhat skeptical about wheat, and in particular, about highly refined wheat products. (See, for example, this exploration by a critic of The China Study of the raw data from counties in China on wheat consumption and its relationship to obesity, heart disease and a host of other ills.) As a fascinating side-note: people who eat a lot of flour are considered, in my husband’s native India, to be just a little bit dumber than other people, which I find interesting, if not at all scientific. But back to breakfast. On its own, the refined sugar in most cereals is worth avoiding, especially in cereals marketed to children. And just to ensure we’re all a bit underwhelmed by the latest ad campaign for Fruity-Loop Cinnamon Crunchios, Marion Nestle’s food tome, What to Eat, has a long chapter on the suspect politics behind the cereal aisle and the fakey marketing claims of heart-healthiness stamped on virtually every box. So I think it’s important to think beyond the box for breakfast, and hopefully in the direction of nourishing, low-sugar, healthy and nutrient-rich meals. I try to make a warm breakfast most mornings, if time allows. Cooking is a pleasant way to get over the fact that Maya has rousted me from bed far earlier than seems humanly possible, and she often takes great pleasure in climbing up on a chair and playing at sous chef. 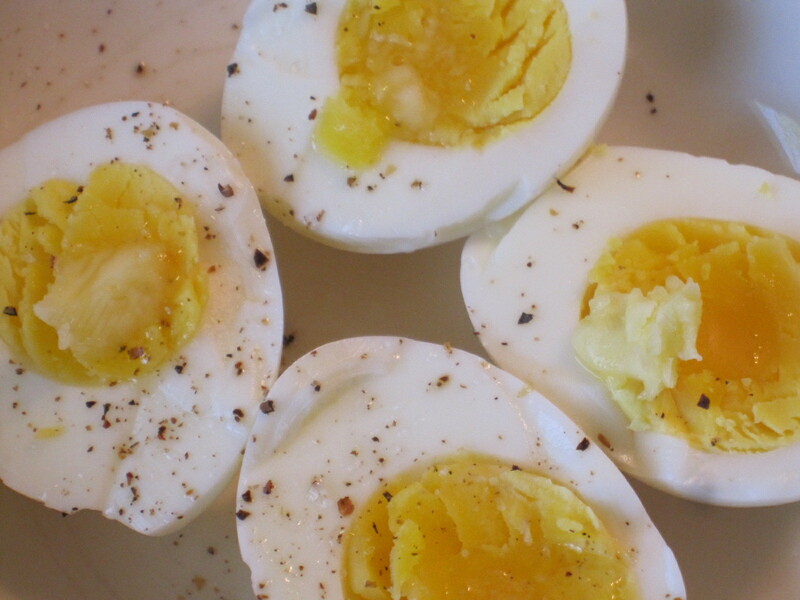 Eggs, in particular, are a favorite, as they are healthy, full of vitamins and minerals, and a complete food. I do think it’s important to cook them thoroughly, as rates for salmonella poisoning are too high and many farm conditions for eggs are atrocious. We like organic, pastured eggs from small farms for this reason, and because they are also higher in vitamins and minerals from the chicken’s more natural diet of grubs and seeds. (Just a “free range” label is misleading; it often means that the chicken never went outside.) As you’ll see from the suggestions below, there’s a reason why Maya’s favorite things to make in her own small wooden kitchen are eggs! 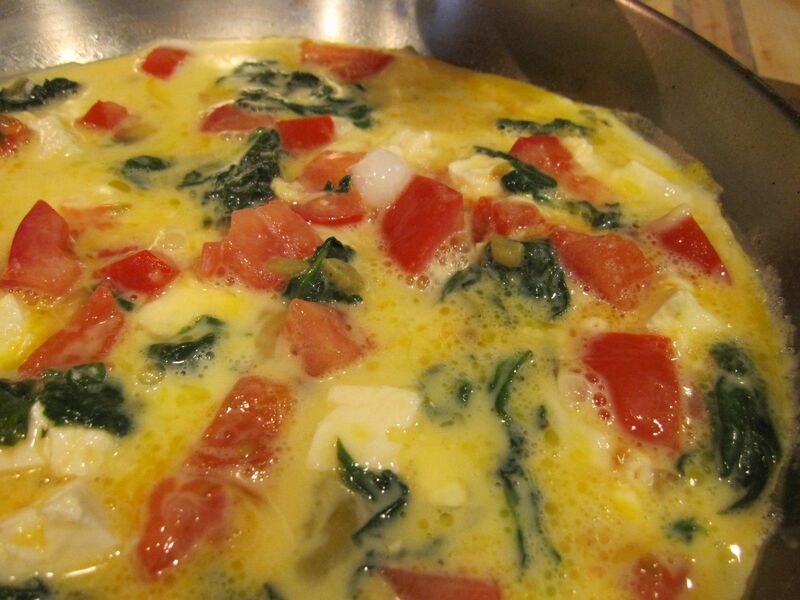 Egg scrambles, which are a great way to bring veggies to the breakfast menu. Just add butter to the pan, and cook the vegetables until the moisture is mostly gone. Favorite combinations include: 1) feta, tomato, spinach; 2) peppers, cheddar and green onion; 3) caramelized onion and swiss; 4) cauliflower with a touch of mild curry and cilantro. Fritters: I don’t used canned veggies, so I take 1/2 cup of frozen vegetables (like corn and peas, and cook in water in the microwave for 2 minutes in a small glass bowl, then drain). Mix the vegetables with an egg, pinch of salt and about a tablespoon of flour and cook in melted butter or oil (I use medium-heat organic coconut oil) to make fritters. Variations to try: add grated carrot, grated coconut, fresh mild herbs like basil, mint, or cilantro. Serve with plain yogurt for dipping. Brown rice, coconut and green lentils, cooked with coconut milk: (Soak the rice for as long as you can — an hour is best if you have the time, but even 20 minutes is better than nothing.) Add 2 cups rice and 1 cup split green lentils (also called moong dal) to the (stainless steel) rice cooker, with 6 1/2 cups water and 1 can of (BPA-free Native Forest brand organic) coconut milk. Cook as normal. Variations: add grated coconut, grated carrots, fresh or frozen peas, cinnamon or grated nutmeg. A bonus no-cook option for really hot days: fruit salad with mint and grated coconut — just use whatever fruit is in the house, and serve it up with plain yogurt for dipping or drop it all into a (glass) blender for a smoothie. To avoid having to use ice and diluting it, try frozen (organic) fruit instead. When they’re not looking, you can even sneak in some avocado and get away with it, most days. Raisins and seeds: Maya loves raisins (I use unsulphured organic ones given the high levels of pesticides on grapes), mixed with organic chopped nuts, pumpkin seeds and other squirrely seeds from the bulk foods aisle. I’ll also throw in some grated coconut. Low-sugar flavored yogurt with granola, ’nuff said. If you like this post, you may want to check out an old, still-functioning grist mill my parents discovered for freshly milled flour, grits, polenta and oats, which are amazing (though not organic). They can be mail-ordered by the pound unless you happen to live near Oak Ridge, NC, in which case you should really just go pick up some of these tasty grits. Does Extended Bottle-Feeding Really Cause Obesity? I hope this adds a few ideas to your early-morning arsenal! This entry was posted in Environmental Health & Safety, Parenting, Recipes & DIY and tagged babies, baby, Boiled egg, Cereal, chia pudding, China Study, cook, eggs, Family, food, green, health, healthy, huevos rancheros, infancy, infants, lactation oatmeal, Marion Nestle, Maya, mommy blog, mother, organic, Organic milk, Parent, parenting, parents, recipe, recipes, Sugar, toddler breakfasts, toddler meals, toddler-friendly food, Weston A. Price Foundation, wheat, Whole grain by Laura MacCleery. Bookmark the permalink. OK, I look at this list regularly, and finally decided it was time to comment and say thank you! Such great ideas that all of us (baby, toddler, mom, dad) enjoy eating! Especially surprised at the chia (never would have tried this otherwise) and the lentil/brown rice. Thanks so much for putting such a diverse and inspiring list of foods together! Thank you!!! I started doing a Google search for toddler breakfast ideas and was appalled at some choices parents make. I just wanted some more inspiration because we can not do dairy. 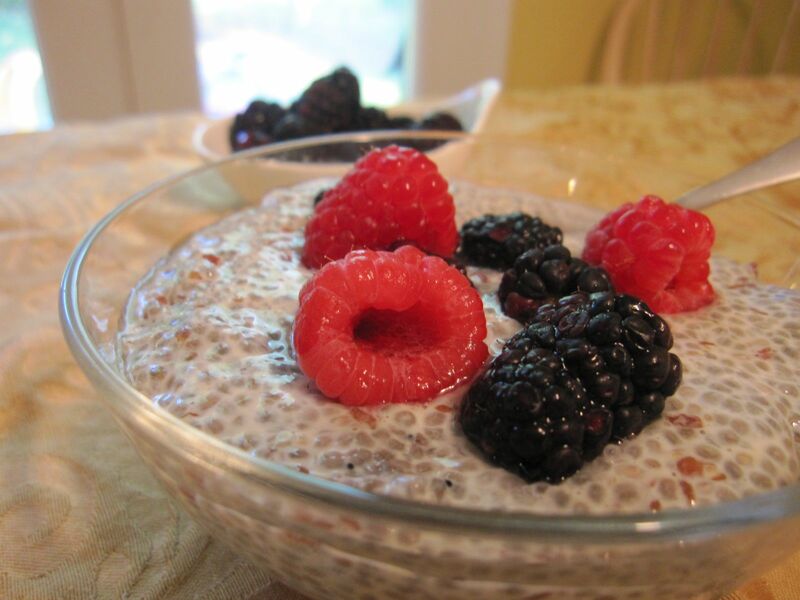 Chia seeds, avocados, and steel cut organic oatmeal are a regular part of breakfast but wanted more diversity. 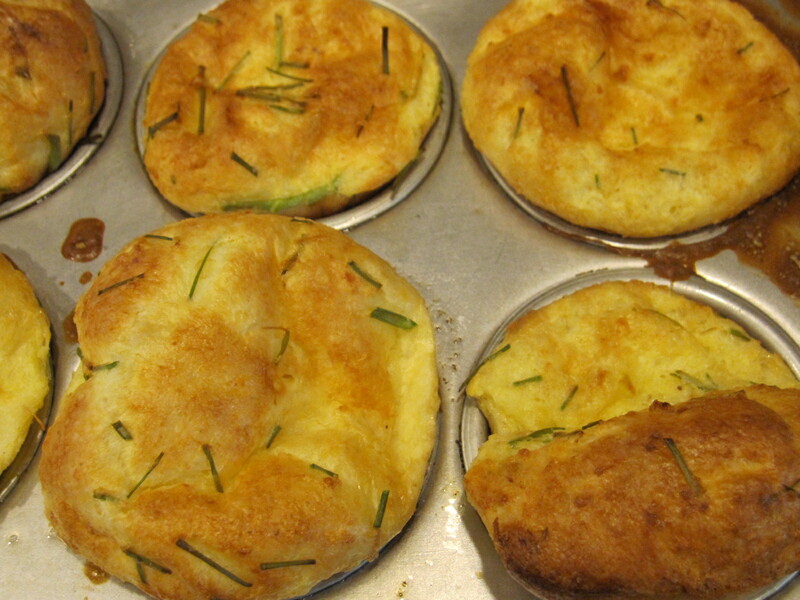 Our 14 month old can eat eggs and I am glad there are a lot of tasty recipes on here! Again thank you for these wonderfully HEALTHY recipes and ideas!!! I’ve had bariatric surgery so I eat smaller portions … These are great options!